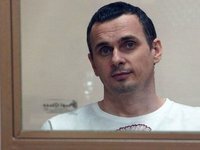 Ukrainian film director Oleh Sentsov, who is being held in Russia, has won the Pro Dignitate Humana award of the Polish foreign minister, the Polish Foreign Ministry reported on its Twitter account on Tuesday. "On the sidelines of the Ukrainian FM's visit FM Czaputowicz announced that Oleh Sentsov will receive this year's Pro Dignitate Humana award. The director in the Russian prison recalled the fate of political prisoners in Russia and occupied Crimea," the report says. The Embassy of Ukraine in Poland, in turn, reported that Czaputowicz announced Poland's intentions to support Ukraine in the future in countering Russian aggression. "Poland will support Ukraine in countering Russian aggression. It does not recognize Russia's illegal annexation of Crimea. Poland has decided to present the Pro Dignitate Humana award to Oleh Sentsov," Czaputowicz said. Ukrainian Foreign Minister Pavlo Klimkin, in turn, thanked Poland for the high award to the Ukrainian film director and expressed the conviction that together with Czaputowicz he would soon be able to watch Sentsov's new film in Warsaw and talk to him personally at the premiere.